Building automation network gateways are devices used to interconnect networks having different protocols or different physical properties. A gateway will, in most cases, be required to translate protocols rather than simply repackage the message and resend it. The protocol translation means interpreting the data as presented by the first protocol, then re-encoding the data for equivalent presentation by the second protocol. In many cases, there is a one to one correlation between elements of data. But that is not always the case. LonWorks has the ability to transmit a “structured” network variable which is a single data entity containing multiple data values. Modbus, on the other hand, is limited to strictly one data value per data entity, or “register”. Therefore, there is potentially a one-to-many or many-to-one translation happening when interconnecting LonWorks and Modbus devices. 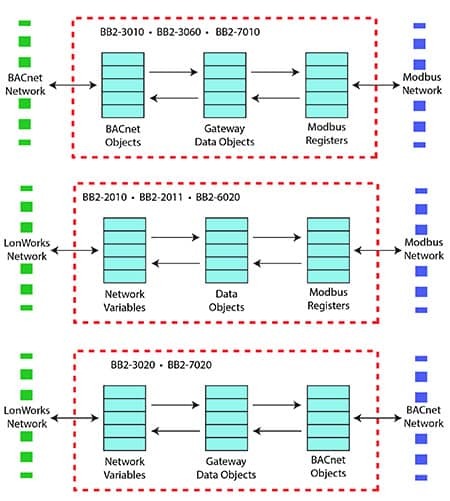 BACnet objects will most often have a single data value that is of primary interest, known as the “present value”. However, BACnet objects always have additional properties attached to that primary value, such as “reliability” and “status” of the present value. 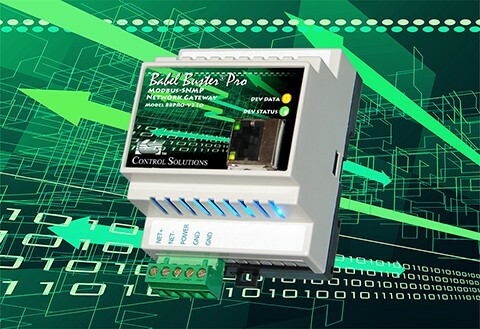 In most cases, the translation will be one-to-one between protocols such as Modbus and BACnet, with the Modbus register containing a copy of the BACnet object’s present value. However, some network gateways will allow querying the additional object properties to make them accessible as Modbus register values. In this case, the translation is one-to-many with a single BACnet object resulting in multiple Modbus registers. Open system architecture is a key element in today's control system designs. Connectivity using standard protocols is a vital ingredient in an open system. The ability to use multiple protocols in a single system enhances the flexibility of the system while allowing one to take advantage of a wider variety of products available on the market. Control Solutions' Babel Buster gateways maximize system connectivity options. Babel Buster gateways from Control Solutions are economical and easy to use. Configuration software is included in the web user interface for most IP models while others have stand-alone configuration software you may download at no cost. Online user guides and videos are provided to get you up and running as quickly as possible. There are no additional drivers or software to buy. Babel Buster®... The Network Gateway Brand Everybody Remembers.